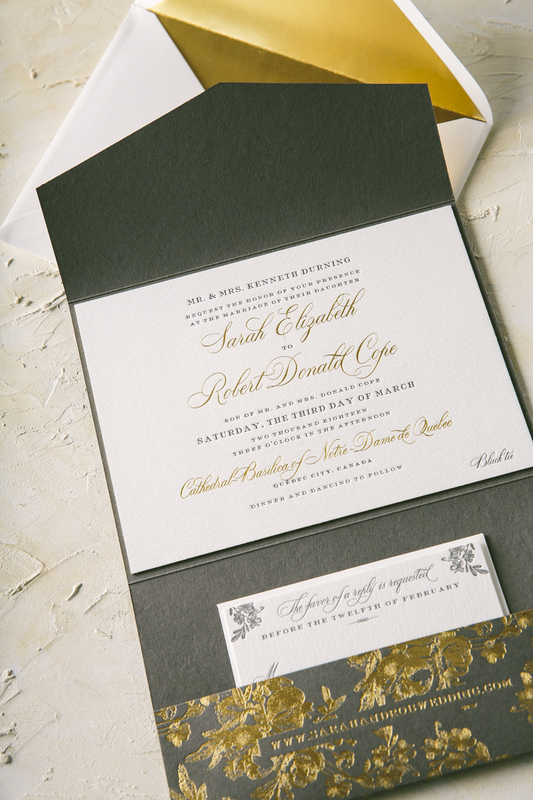 Bella Figura NYC had the pleasure of working with Sarah and Robert to create their charcoal and gold foil wedding invitations. 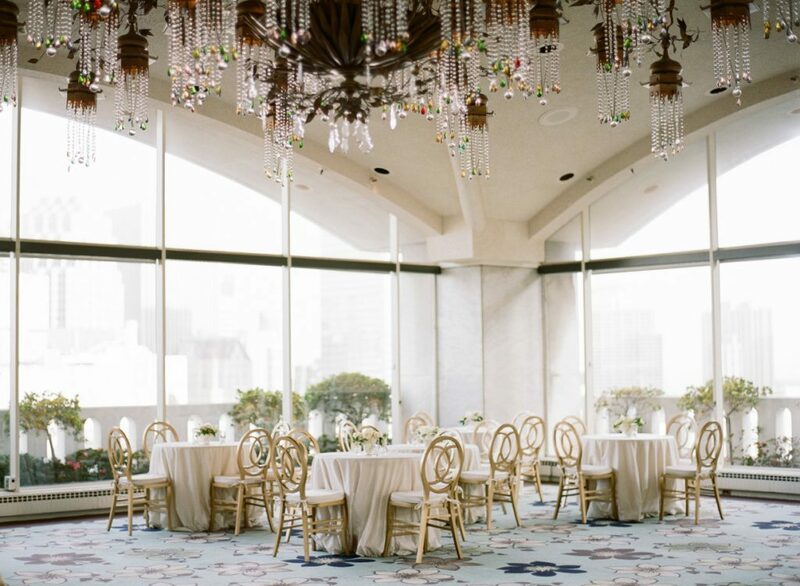 The couple’s suite reflected their venue perfectly as they were married in the ornate Cathedral Basilica of Notre Dame De Quebec in Quebec City. 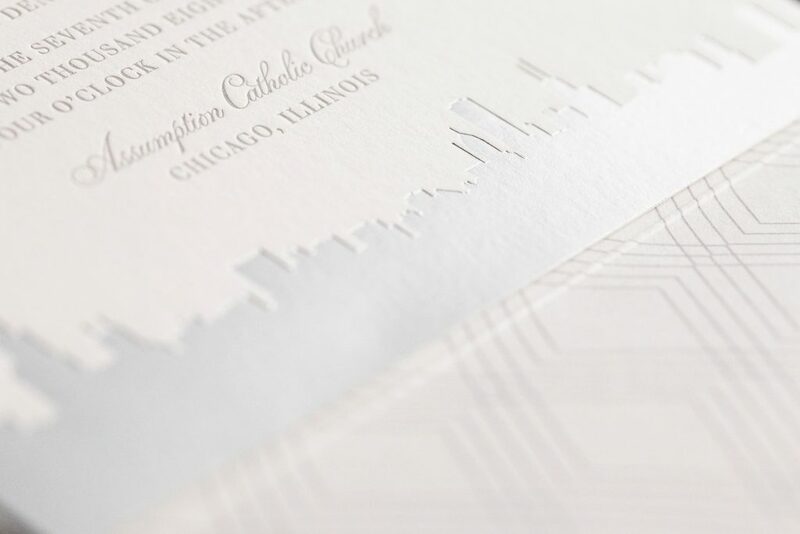 The cathedral is adorned with beautiful gold accents and this idea was carried onto the invitation as well as the pocketfold. 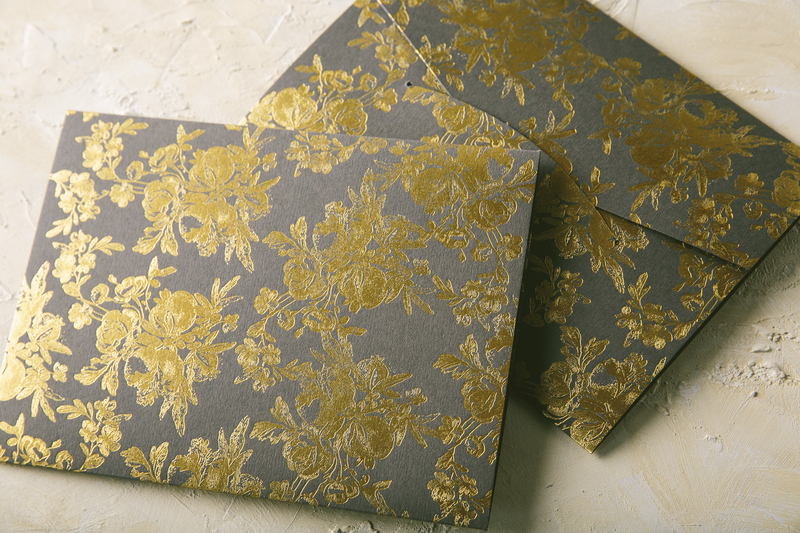 With our luxurious Bella Gray paper as the backdrop for this all over elegant garden pattern, we have no doubt guests couldn’t wait to open the pocketfold to find out what was inside. 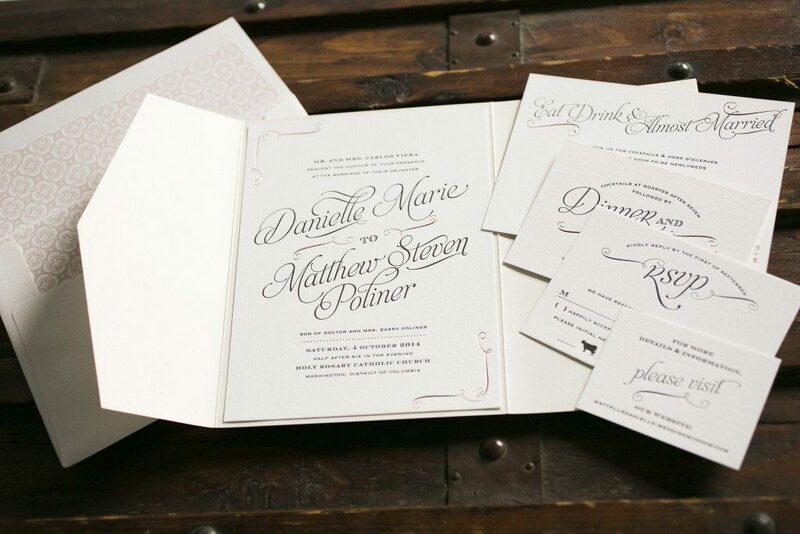 The floral pattern was also added to the corners of the reply card to pull everything together from the outside in. 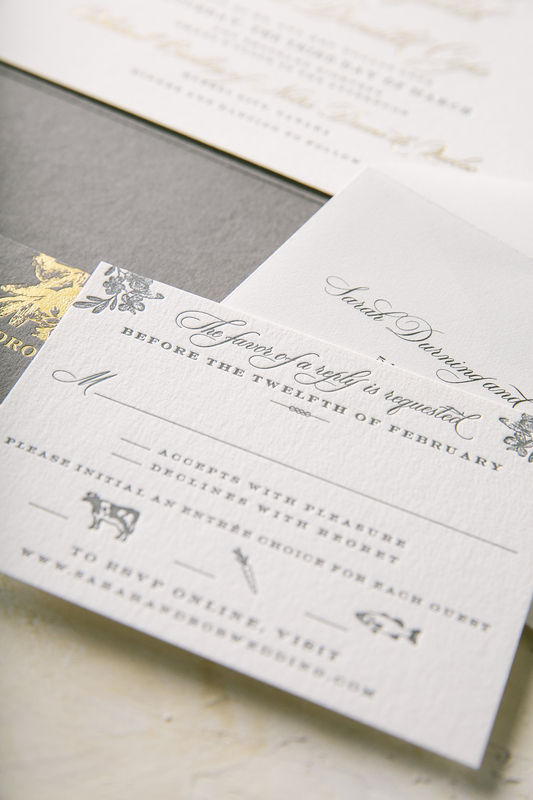 A solid gold foil envelope liner was added as the finishing touch to this timeless suite. 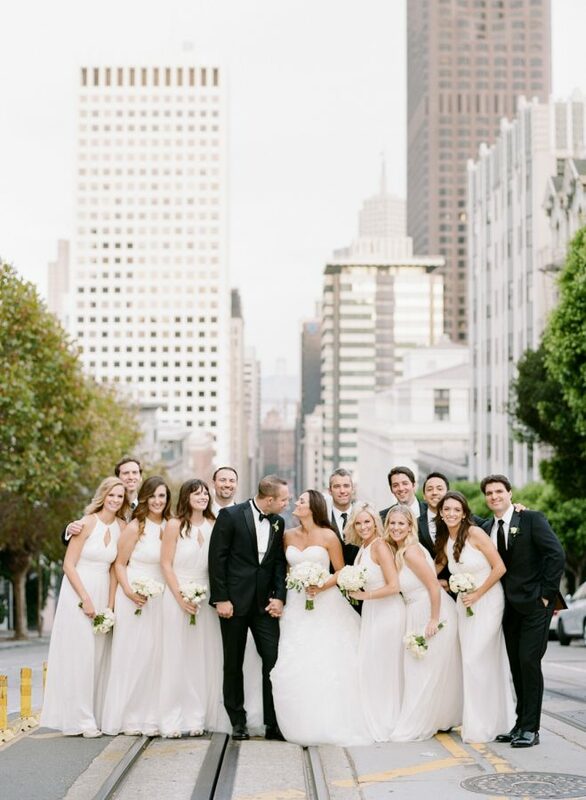 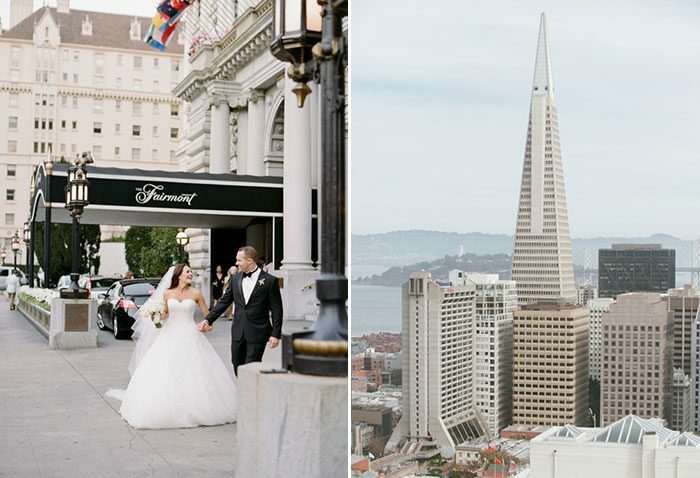 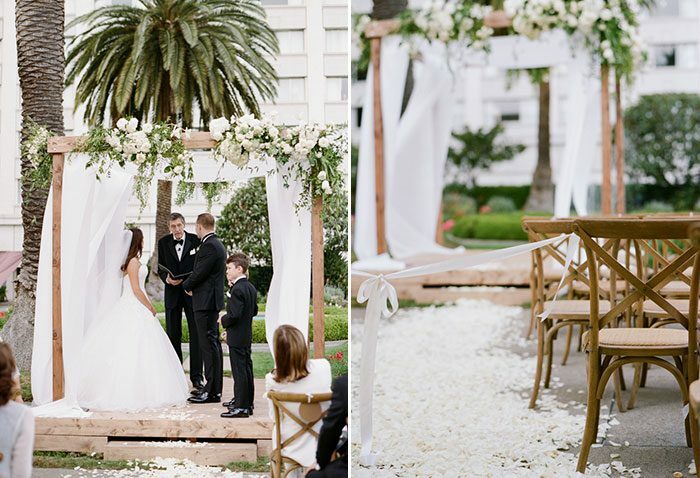 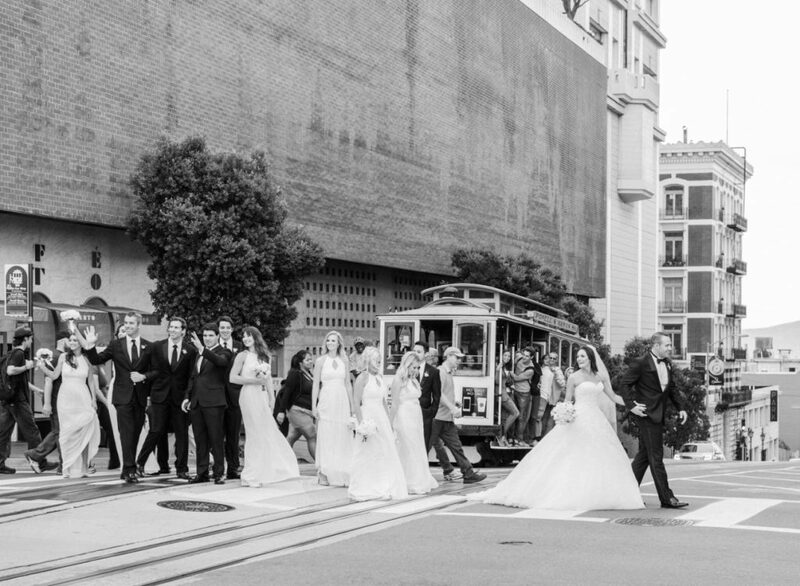 Meaghan and Benjamin infused many personal details – like personalized vows and a hometown venue – into their timeless San Francisco wedding at the Fairmont Hotel. 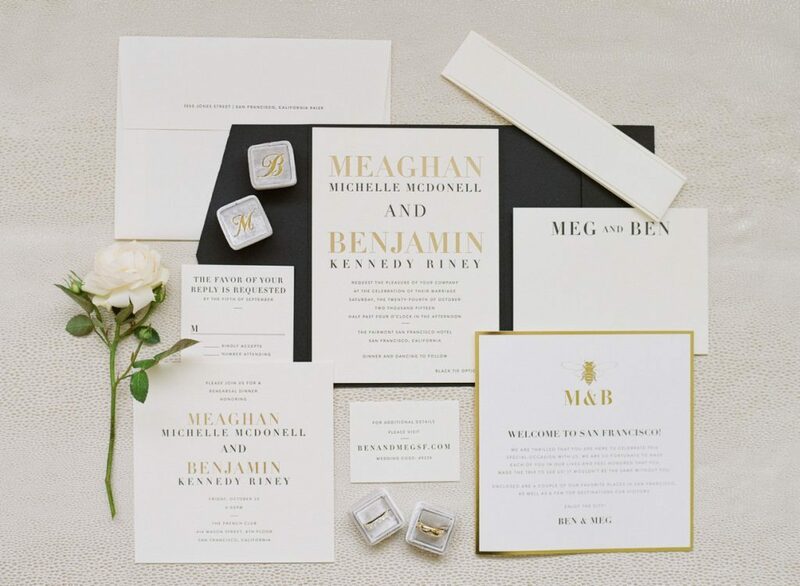 To set the tone for their big day, they customized our Roosevelt design with classic black letterpress ink and gold matte foil stamped accents. 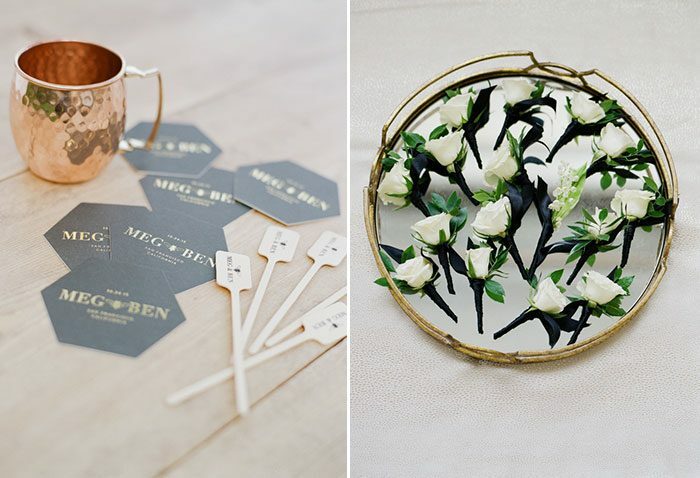 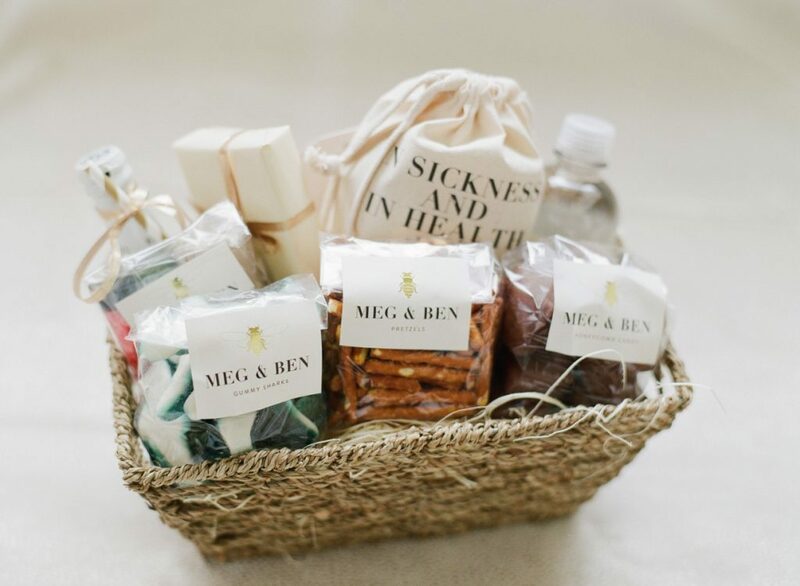 The bride’s nickname for her groom – “B” – inspired the petite golden bumblebee motif that was used on many of the design elements throughout the wedding, including the programs and menus that we printed, as well as their cocktail napkins, welcome basket goodies, and even the cake! 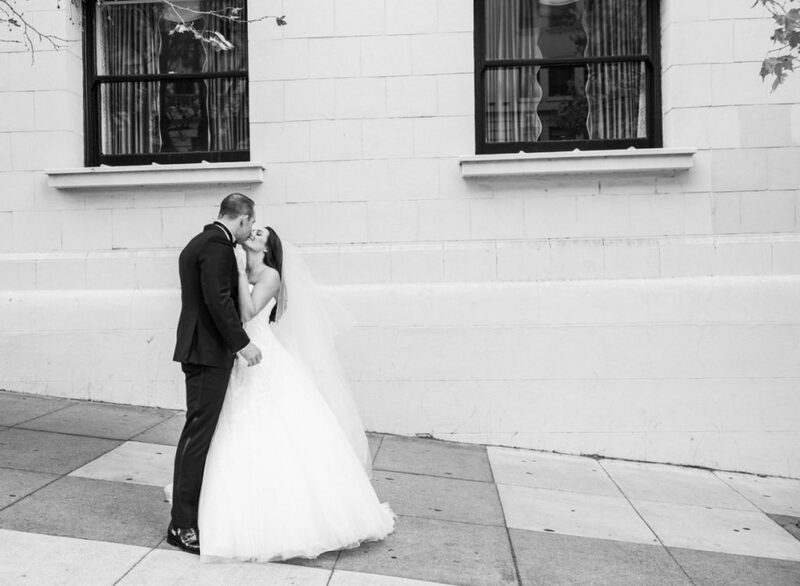 Style Me Pretty has even more photos from their big day, but here are a few of our favorites – take a look! 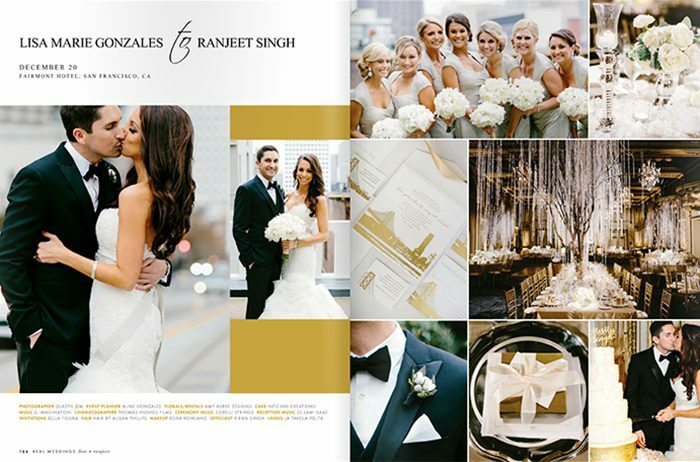 Lisa and Ranjeet worked with in-house designer Lindsy Talarico to create their stunning gold foil stamped wedding invitations. 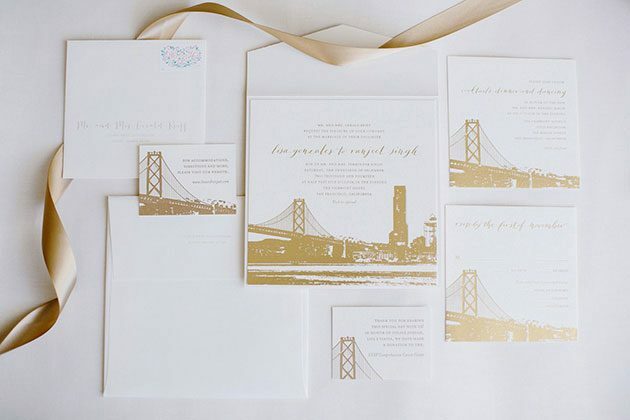 Their pocketfold style invitations feature our Charmed San Francisco design, with the Golden Gate bridge shining in gold matte foil and Mitty calligraphy accents by Nicole Black adding a sophisticated touch. 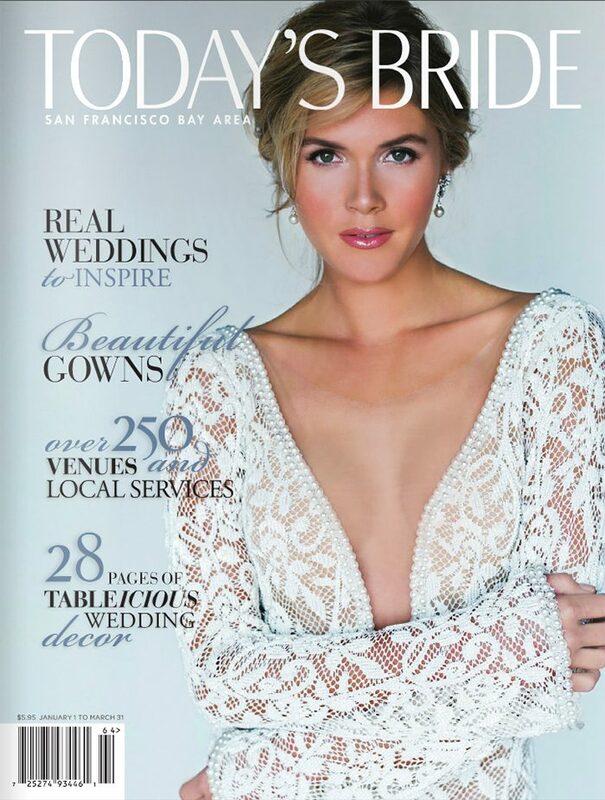 Not only were their invitations and real wedding featured by Today’s Bride San Francisco magazine, they were also featured by Brides! 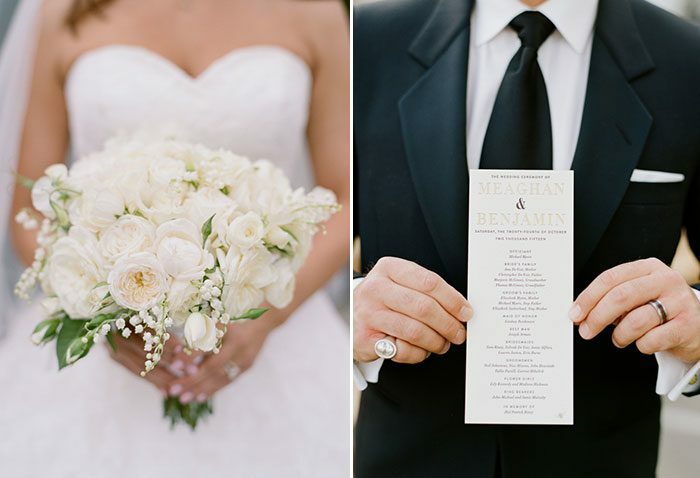 Be sure to check out both features to see more photos and details from their big day. 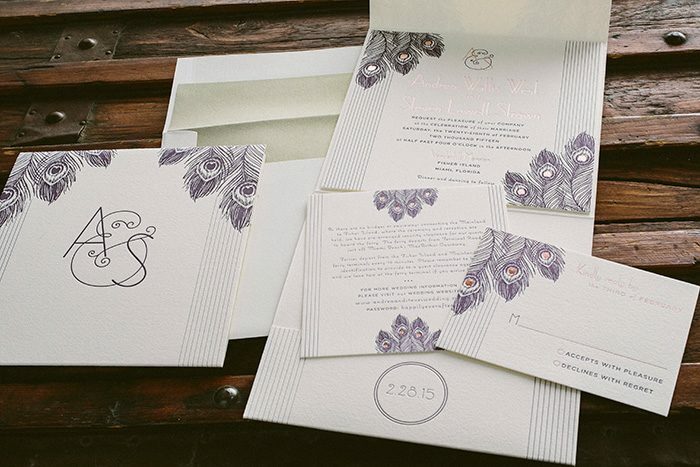 Danielle and Matthew made minor alterations to our Serendipity design by adding design-inspired corner embellishments. 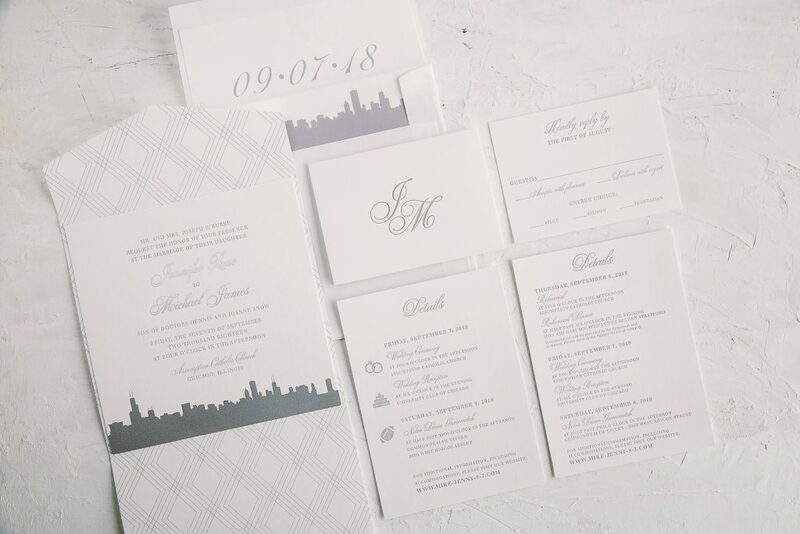 They added a pocketfold to round up the reply card, reception card and website card, along with the invitation to the welcome party being held on the eve of the wedding. 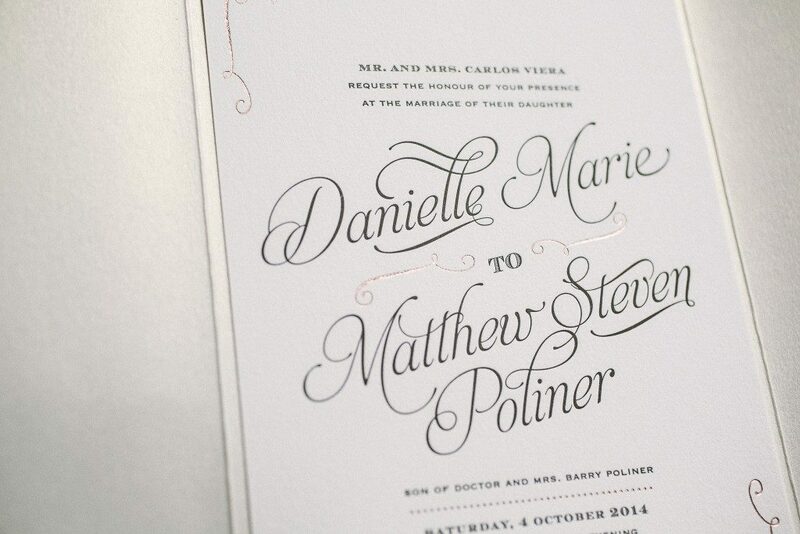 Their neutral color palette was carried throughout these black and rose gold foil stamped wedding invitations. 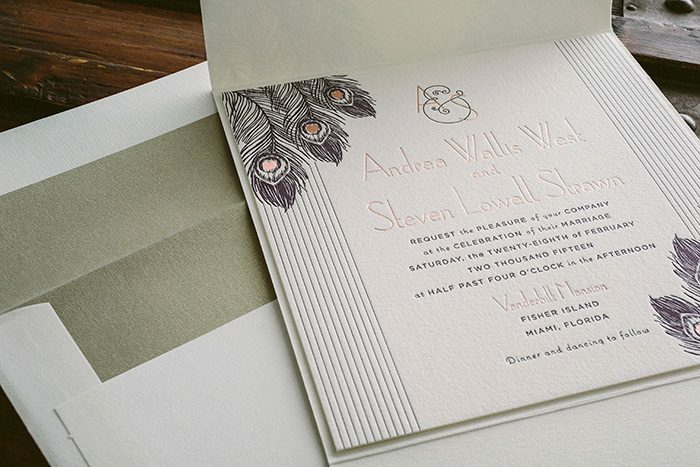 For their recent wedding at the Vanderbilt Mansion on Fisher Island, Andrea and Steven customized our Rose design by replacing the floral motif with the hand-illustrated peacock feathers from our extensive collection. 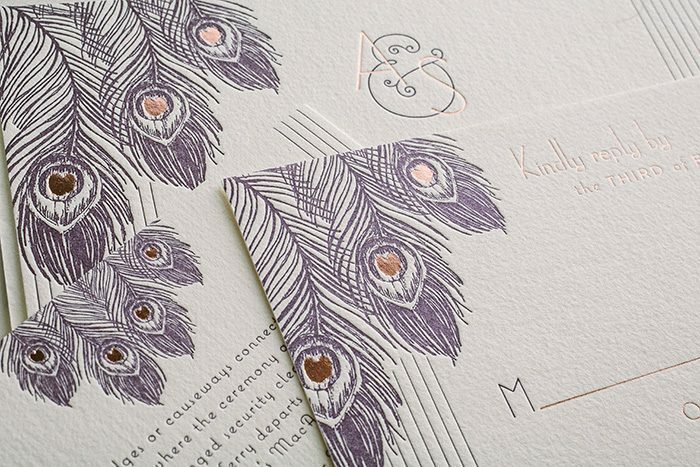 Rose gold shine foil and regalia letterpress ink were an elegantly cool combination, while a custom monogram and letterpress printed pocketfold added decorative flair to these art deco wedding invitations. 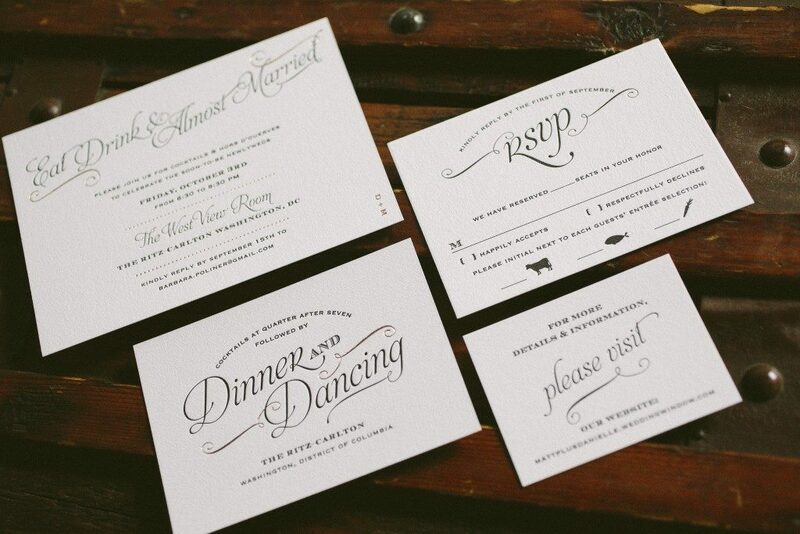 Our Traditional Script wedding invitation design is graceful, elegant and loaded with romantic charm. 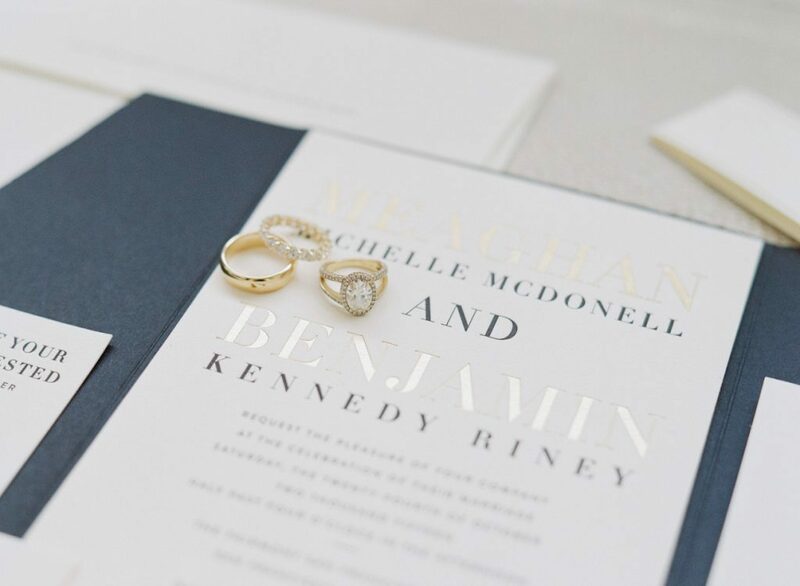 Gabrielle and Dillon opted for gold shine foil and black letterpress ink – a classic pairing that looks ultra sophisticated on our ivory cotton paper. 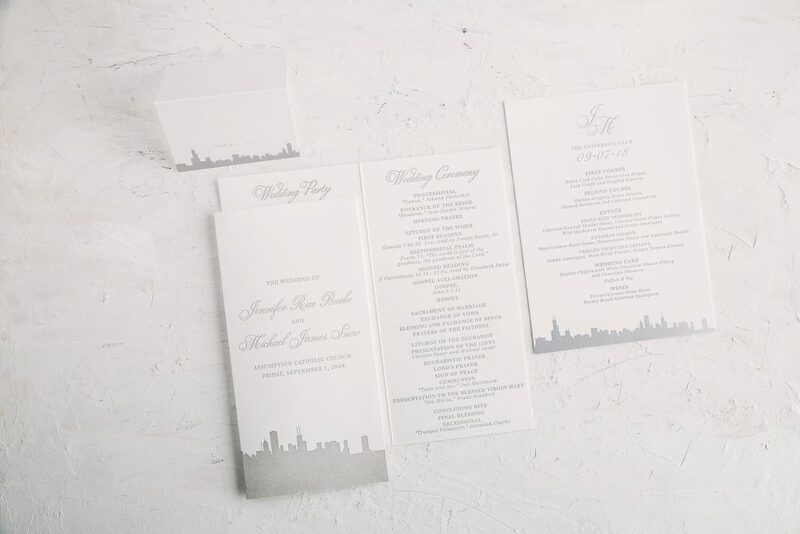 A metallic opal pocketfold added to the presentation and kept additional cards in order. 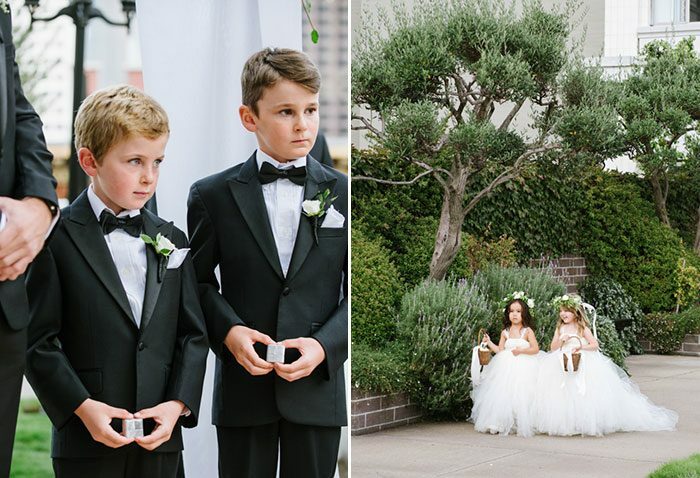 If you’re planning a formal wedding, be sure to check out designer Beth Barr’s collection – on sale through the end of August!